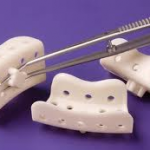 Mandibular stock trays will sit on top of large mandibular tori, or at best scrape the lingual tissue covering the tori during the impression, again resulting in complications during the impressioning phase for any application. In the past, solutions included cutting down the lingual flanges to make them end superior to the mandibular torus, or to take a preliminary impression which was not seated fully and then from the model fabricated, make a custom tray and re-impress. Clinicians have also attempted to use maxillary trays to impress lower arches, however it is difficult if not impossible to retract the tongue to accomplish this procedure. Yung-tsung has suggested taking a maxillary tray, cutting out the palatal portion and adding utility wax to create a tray that will capture lingual tori. 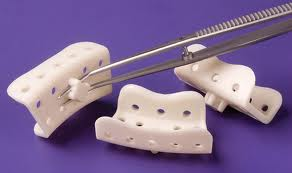 Until now, there has not been an easy solution for satisfactorily modifying a stock tray to impress a maxillary tuberosity, unless one removes the centre of a plastic tray, and most often it required a first impression doing the best one could clinically, and then following with a final impression utilizing a custom tray fabricated from the initial model. The clinical challenges that face the dental practitioner when attempting to impress these bony exostoses or dental mal-positions have now been solved. New heat Customizable Impression Trays from CLINICIAN’S CHOICE® represent a noteworthy evolution in impression trays, by taking truly anatomically designed trays and adding the ability to self customize chair- side. The result is a precise fit with vertical drive that rivals that of a custom tray (but without the inconvenience and cost involved to make a custom tray) for perfectly precise impressions every time. A new disposable heat mouldable tray (HeatWave, Clinician’s Choice/Clinical Research Dental) uses a biopearl modified polyactic acid-derived, extremely stiff, and inflexible plastic material. With heat moudable tray, the clinician can easily self-customize the thermoplastic trays by hand after immersing them in water for 60 seconds at 70oC/158oF. The tray can then be shaped by hand and moulded to a patient’s particular arch size and contour. After adaption, the tray will assume its normal rigidity at room temperature or by running under cold water, allowing for a precision impression. The ability to adapt the tray chair-side provides a significant advantage for all full arch impressions, and specifically in cases where exostoses, tori and mal-positioned teeth are present and stock trays cannot seat properly, thereby inhibiting the ability to capture accurate detail. This unique mouldable feature allows for softening of the palate to indent the tray to make room for maxillary torus or to expand the buccal flanges of the upper tray to work around large tori, maxillary exostoses or labially displaced teeth. For this mandibular case, the presence of a torus, (or lingually displaced tooth such as a second premolar) is no longer an obstacle to obtaining an exquisite mandibular impression. After heating the tray the lingual flanges can be moulded to any position so as to be positioned to accommodate the exostosis or mal-positioned tooth. 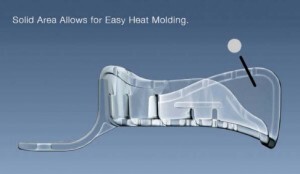 Heat mouldable trays also eliminate the patient discomfort caused when stock trays get caught up on bony anatomical variances. Because heat mouldable trays provide a better, more anatomical fit, impression space is limited which means you’ll also use less impression material, similar to a custom tray technique. Moreover, this precise fit creates optimal dynamic pressure around the arch during insertion which greatly reduces the risk of impression distortion. Heat Customizable Impression Trays are available in 4 upper and 4 lower sizes and are designed to accommodate square, round, or gothic shaped arches. The ability to customize the tray limits the sizes needed thereby reducing inventory. A unique caliper measuring system, measures both arch width and angle, allowing for easy selection of the ideal sized tray thus drastically reducing tray selection time. There are also heat customizable quadrant impression trays in the current market. While the use of a full-arch impression tray is essential to the success of complex or multiple restorations, the use of a quadrant impression tray can be acceptable, and even advantageous, in simpler cases where only one quadrant is involved. In these cases, a quadrant tray may provide greater patient comfort, specifically to those patients with gagging tendencies, while also reducing the amount of impression material required, and overall procedure costs. Until now, quadrant trays have presented challenges to the clinician. Their standardized designs simply were not developed to accommodate the varying arch shapes and widths that present in clinical situations. Further, when compared to a full arch tray, many plastic quadrant trays do not offer the degree of support and stability required to prevent impression distortion and inaccuracies. With the introduction of the new heat customizable quadrant impression tray, these clinical challenges have been eliminated.